Det er mandag igjen, og det betyr en ny utfordring hos The Crazy Challenge. Denne gangen vil vi se " Barndoms minner". Vår sponsor er Digi Doodle Shop, og de har masse flotte digistempel som passer til temaet vårt. Vil også gjøre dere oppmerksom på at vi fra denne utfordringen går over til å kjøre utfordringer annen hver uke. Monday again, and that means a new challenge at The Crazy Challenge. This time our challenge is " Childhood memories ". Our sponsor is Digi Doodle Shop, and they have plenty of digis who fits to this theme. We also have a announsement. We are going fortnightly from this week. Jeg har brukt All Dressed Up 2 fra Digi Doodle Shop. I have used All Dressed Up 2 from Digi Doodle Shop. Og her er skissen fra Sweet Sketch Wednesday som jeg har brukt. 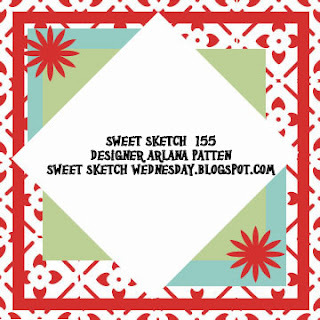 And here is the sketch from Sweet Sketch Wednesday that I have used. Da skal jeg sette meg en stund ved bordet mitt. Now I am going to sit by my table and make a card or two. This is so cute! I love the little charms and the beautiful flowers. Thanks so much for joining us this week at Sweet Sketch Wednesday. I love the brown and pink together. Such a nice color combo. Love your added charm. Thanks for joining us. Cute card, great layout & embellishments! Beautiful card. Love the colors together and you flowers. So glad you could join us at Sweet Sketch Wednesdays. I love this cute image from Digi Doodle Shop. Your added purse and heart charm are precious additions! Always love that brown and pink color combo and your flowers and pearls just set everything off. Love how you carried the diamond square to the inside and I also like how you do your insignia on the back! Thanks for sharing. Adorable, absolutely adorable!!! Love your embellishments and that super sweet image. Thanks for joining us at Sweet Sketch Wednesday. The softness of your card is so beautiful and I am in love with your charms! Hope you had fun playing while your hubby was away. Thanks for sharing with us at Sweet Sketch Wednesday. Thanks for playing along in MCS challenge and good luck! Love the color scheme here! Looks so great with this image. Thank you so much for joining us this week at Our Creative Corner!